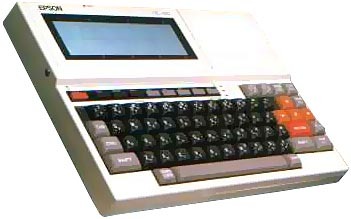 This computer is the successor of the HX-20. The main cosmetic difference is a wider screen that can be adjusted to the right angle. There are 2 ROM slots under the machine to implement additional ROM programs. On the right of the LCD display can be plugged a tape-recorder, a plotter, RAM expansions, a lot of things or ... nothing. A lot of peripherals were available for this little computer (see hardware page), at least in japan. The PX-4 was logically followed by the PX-8. CO-PROCESSOR CMOS 7508 4bit : handles housekeeping, clock, battery, etc. see more Epson PX 4 / HC 40 Ebay auctions !